As you might now be aware Nia is a wonderful mix of elements from three different movement forms from three different arts. Martial Arts is one of the art forms. Aikido is one of the movement forms from the martial arts. According to the Nia White Belt Manual that I received during my Nia White Belt Intensive Aikido was the martial art that Debbie Rosas and Carlos Rosas enjoyed the most. 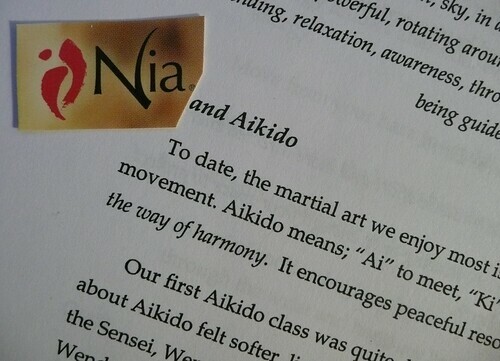 The spirit of it that was added to Nia was the translation of “the way of harmony”. Conflict is resolved lovingly. During the intensive I remember the idea was mentioned of using the opponents own weight and energy to take control of the situation. While in Nia we don’t have opponents or enter into competitions with each other, the example was intended to express the idea that a blending of energies makes it easy to move. Aikido in Nia is the notion of a peaceful warrior. As with all of the art forms that have been studied in order to create Nia, it is ideas, concepts, and moves that have been integrated. All of the movement forms are understood to be something that takes practice and maybe even years of training. That is respected when we talk about forms being added to Nia. Aikido brings grounded energy to Nia. We practice spiral swirling motion blending the energies outside with the energies inside. Focusing on our center, the hara, we practice grace. We also exercise our awareness and embrace the moment. We hone our skills of moving from lines into spirals and spirals into circles with the energy surrounding us. Aikido somewhat reminds me of Nia itself, they are both a blending of energies and movements. This entry was posted on January 16, 2010 at 11:26 pm	and is filed under Movement Forms of Nia, Nia. Tagged: Aikido, Aikido energy, Carlos Rosas, Debbie Rosas, martial arts, Nia, Nia energy, Nia exercise, Nia Movement, peaceful warrior, spirit of Nia. You can follow any responses to this entry through the RSS 2.0 feed. You can leave a response, or trackback from your own site.